It is said that When the government has reached a dead end and it has no solution to the crises it has created by it self, and when people fed up with oppression and injustice, unlike the past are not going to give in to oppression, it is time for widespread protests and social upheavals. So now, for the past four days, people fed up with tyranny, oppression, unaffordable prices, poverty and unemployment, have taken on the streets across the country, and in a united and coherent front they shout their demands to end the existing hell. The demands that today have provided the grounds for mass protests and rallies of the working people of Iran, are centered on protesting poverty, unaffordability, and unemployment, demands that has been shouted for decades by workers, teachers, students, nurses and all other levels of the workers, yet the rulers without any considerations have been occupied with plundering and looting of social wealth. What we see today in the streets of various cities of Iran is the eruption of the accumulated anger of the masses of the working people of Iran from the plunder of the billions of top government officials and individuals and financial institutions affiliated with the power sector on the one hand, and the poverty and annihilation of millions of people on the other hand, while the mass unemployment of millions of workers and young people, the beating and oppression of street vendors and the killing of kulbars, the imposition of wages well below the poverty line on the workers, and use of violence, lashes, prisons, executions, and the oppression of any demand for justice and freedom continues. Those who used to respond to any and every rightful protest by workers and people with security charges, trial and prisons are now faced with the thunderous anger of millions of Iranians and call their protests ‘sedition’ and ‘fitna.’ They should know that now is the time for massive, humane changes in this country and no force of oppression can withstand the quest of us, workers and people of Iran, for justice and freedom. 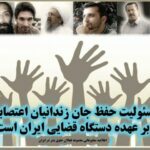 We, together with the toiling masses of Iran, shout something that should be clear: Our demands for an end to poverty and misery should be realized; all oppression and prison should end; all political prisoners should be freed and predators of social wealth and those responsible for oppression should be prosecuted and tried, no matter what position they hold; the wealth stolen from people by financial institutions should be given back; the minimum wage of workers and employees of both public and private sectors be increased fivefold and the massive income of government authorities be slashed; the right of workers to form independent trade unions and civil organization and their unconditional freedom of speech and press and freedom of political parties is to be guaranteed and the demands of millions of Iranian masses be realized. 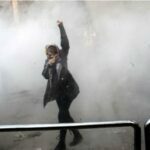 It should be self-evident that ignoring the demands of workers and toiling people of Iran by resorting to demagoguery or crackdown or attempts by governmental factions or the opposition that is driven from power before to base itself on the wave of popular protests will not bear any fruit. This time, it is us, the workers and people of Iran, who will write out own destiny, with unity, solidarity and continuation of protests. A group of 19 human rights organizations call the international community and United Nations bodies to protect the rights of Christians in the Islamic Republic of Iran. In the summer of 2016, Iranian authorities increased their persecution of Christians, honing in on converts from a Muslim-background. Between May and August 2016, in locations across Iran, security forces arrested a total of 79 Christians, according to informed sources, family members, and friends. The majority of those arrested were interrogated and detained for periods ranging from a few days to months. At the time of writing, some of these 79 Christians remain in detention and have still not been formally charged. Rights groups believe the true number of Christians apprehended by the authorities could be notably higher, as many arrests would have gone unreported. In 2012, the Iranian government instituted polices to bar converts from Muslim backgrounds from attending services in official churches. Instead, Christian converts are forced to gather in informal groups known as “house churches”. These gatherings are considered illegal by authorities and are often raided. In August 2016 alone, security agents allegedly raided at least four house churches and house church members were arrested and interrogated. The individuals responsible for house churches often face charges of “acting against national security through the establishment of house churches”. A group of four converts from Rasht were arrested in May 2016 and charged with “acting against national security.” A verdict is still pending from their hearing on 15 October 2016. Three of these men also faced charges of drinking communion wine and are appealing their sentences of 80 lashes each. Many others of those recently arrested are still waiting to know what charges will be brought against them. Iranian authorities have put pressure on Christian leaders to emigrate, either through direct threats or through intentional harassment. Some church leaders have reportedly been told during interrogation that they will face 5 to 10 years in prison unless they leave the country. In other instances, Christians have said that harassment has taken the form of a daily summons to security offices for questioning, confiscation of documents such as identity cards to prevent the victim from buying or selling property or cars or forcing the Christians out of their jobs. This pattern of treatment of Iranian Christians and converts violates Iran’s constitutional and international legal obligations. Article 14 of the Islamic Republic’s constitution contains provisions, which uphold basic religious rights for some non-Muslims including Christians, Jews, and Zoroastrians. Article 19 also enshrines the principle of non-discrimination and article 23 prohibits authorities from investigating a person’s belief or taking action against someone solely on account of his or her beliefs. As a state party to the International Covenant on Civil and Political Rights, the Islamic Republic of Iran is obligated to ensure non-discrimination under Articles 2 and 26 and freedom of thought, conscience and religion under Article 18. Article 18 specifically protects the right of a person to change their religion. Since the lifting of international sanctions under the Joint Comprehensive Plan of Action (JCPOA), governments worldwide have been showing a commitment to improving relations with Iran and developing business opportunities. In June 2016, for example, the European Parliament published an analysis of EU-Iran relations in the wake of the nuclear agreement, entitled “An EU strategy for relations with Iran after the nuclear deal”. The strategy disappointingly includes very little mention of human rights. (1) Governments should factor human rights, including the rights of religious minorities, into all bilateral dealings with the Islamic Republic. Governmental agencies should explore avenues beyond dialogue alone to ensure human rights violators are held accountable and that trade and diplomatic relations do not contribute to further abuses. (2) The Secretary General and newly appointed Special Rapporteurs on freedom of religion and human rights in Iran should monitor and report extensively on violations of freedom of religious of people in Iran, in accordance with their mandates before the United Nations. 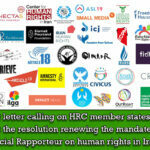 (3) The Islamic Republic of Iran must ensure that the values enshrined in the Iranian Constitution, the Universal Declaration of Human Rights, and the International Covenant on Civil and Political Rights are upheld and that the right to freedom of religion and belief, including the right of conversion and of non-belief, for all its citizens and residents of the country to be respected. 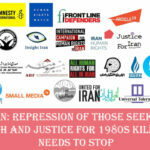 Political Prisoners in Rajai Shahr Prison: Stop Executions! 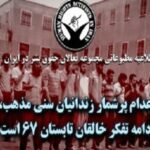 HRANA News Agency – A group of political prisoners in Rajai Shahr prison in reaction to the mass-executions of Sunni prisoners and transferring three other political prisoners to an unknown location, wrote a letter to the Secretary-General of the United Nations and announced their hunger strike and called on him to try to stop executions in Iran. 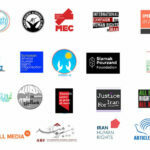 HRANA – Fourteen Human rights organizations released a joint statement, expressing deep concern about the dire condition of political prisoner Afshin Sohrabzadeh, who is dealing with cancer and illness in Minab prison, where he was exiled. 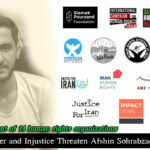 The undersigned organizations highlighted the lack of medical attention threatening Afshin Sohrabzadeh’s life and demanded that the Iranian authorities allow for a just trial according to the Iranian laws and provide him the urgent medical attention that he needs. Seven years ago, Afshin Sohrabzadeh was sentenced to 25 years in prison, after being convicted of working with Kurdish political parties. Since then, he has been held in a number of prisons in Iran. Throughout these years, this political prisoner has suffered from several diseases, including colon cancer. He was exiled to Minab Prison, where he underwent colon surgery in 2015. The operation was a failure and resulted in infection and internal bleeding. In protest against his situation and the lack of proper medical care, he began a hunger strike by sewing his lips closed on Monday, April 11, 2016. 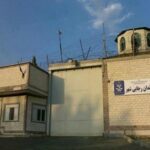 Amnesty International published an Urgent Action Statement for Sohrabzadeh, titled Prisoner In Need of Urgent Medical Care. Based on published documents, the head of Minab Prison announced that he was saved at least once from certain death. Sohrabzadeh was deprived of health insurance while incarcerated and his insurance card was confiscated at the time of his arrest. The high cost of treatment and medication and the inability of his family to provide it made his situation more difficult. The right to life is one the most basic rights of every human being. Iran’s Judiciary is causing serious physical harm and even death of prisoners during their imprisonment by ignoring their right of life. Akbar Mohammadi, Valiollah Feyz Mahdavi, Abdolreza Jabari, Amir Hossein Heshmat Saran, Omidreza Mirsayafi, Mohsen Dogmechi, Hoda Saber, Naser Khani Zadeh, Mansour Radpour, Seyed Mohammad Mehdi Zaliyeh Naghshbandian, Alireza Karami Kheir Abadi, Afshin Osanlou, Saeed Kamali, Ali Naroui, Mostafa Nosrati and Shahrokh Zamani are only a few of the prisoners who have died in prison due to the lack of medical care by Iran’s Judiciary system. Afshin Sohrabzadeh’s health is a cause for great concern and there is fear he will perish in prison like the other prisoners mentioned above. This political prisoner is in urgent need of medical care outside of prison, and without any limitations. 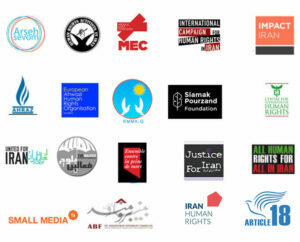 We, the undersigned organizations, demand that the Iranian Government acts within the framework of the UN’s international human rights treaties, the laws of the Islamic Republic of Iran, and human values, and, provide full and urgent medical care for Afshin Sohrabzadeh. We are also demanding that Mr. Sohrabzadeh be granted immediate medical furlough, before he is provided with a fair trial based on the rule of law. We urge the Iranian Judiciary to begin an investigation into the mistreatment and torture taking place in the Kamyaran Intelligence Office, based on the violations in the case of Afshin Sohrabzadeh and the many cases before him.